Rushbrook Mill once used the flow of the River Gipping to drive a water wheel and the mill race still flows beneath the building. 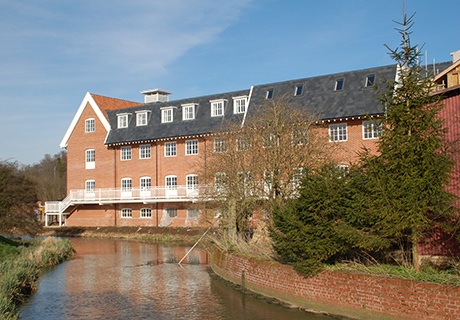 The mill pond provides a tranquil setting for this ambitious refurbishment which now includes a modern office building and 22 luxury apartments. The original mill had been extended with poor quality industrial sheds which obscured the attractiveness of the riverside setting. Once these sheds had been removed the original mill building could be seen to stand against a backdrop of water meadows. We worked closely with developers Braceforce Group to produce a design which integrated the requirements of a modern open plan office building into a building which sits well in the landscape and has the appearance of having been added-to over time. 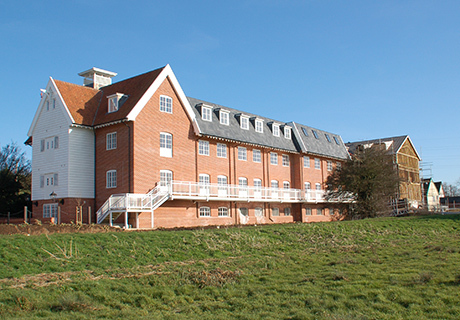 The original mill building has now been converted for residential accommodation and the new office building is perfectly suited to house the administration for the three recently combined PCT areas in the region.